DADT on Trial: Decision Expected Friday! The landmark trial of Maj. Margaret Witt wrapped up yesterday, and Judge Ronald B. Leighton announced that he will deliver his decision this Friday at 1:30 PM PDT. As [Maj. Witt’s] trial closed, [Judge Leighton] expressed strong doubts about government arguments seeking to have her dismissal upheld. […]In 2006, Leighton rejected Witt's claims that the Air Force violated her rights when it fired her under the "don't ask, don't tell" law. An appeals court panel overruled him two years later and said the military can't fire people for being gay unless it shows their dismissal was necessary to further military goals. The ruling left it to Leighton to determine whether her firing met that standard. At the end of a six-day trial, he suggested the ruling tied his hands. "I made my call with regard to whether this act was constitutional," he said. "My colleagues - my friends - said, 'Ron, you got it wrong,'" Leighton said during an extensive back-and-forth with a Justice Department lawyer. "They told me what I needed to do, what I needed to ask." The Seattle Times also noted Judge Leighton's skepticism, writing: "[A]s the trial closed he expressed strong doubts about arguments made by government lawyers seeking to have Witt's dismissal upheld." President Obama vowed to repeal DADT this year, and earlier this month, a judge ruled DADT unconstitutional. The executive and judicial branches have spoken. 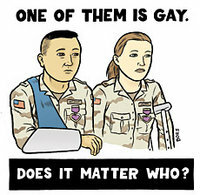 It's time for Congress to repeal DADT once and for all. Since 1993, more than 13,000 service members have been discharged due to their sexual orientation. At least 240 of those service members have been discharged since President Obama took office. While the Senate failed to take up the Defense Authorization Act and DADT repeal Tuesday, the issue will be back in a matter of weeks, and it is critical to keep the pressure on. Join the ACLU in urging Congress to act this year to finally end DADT once and for all.